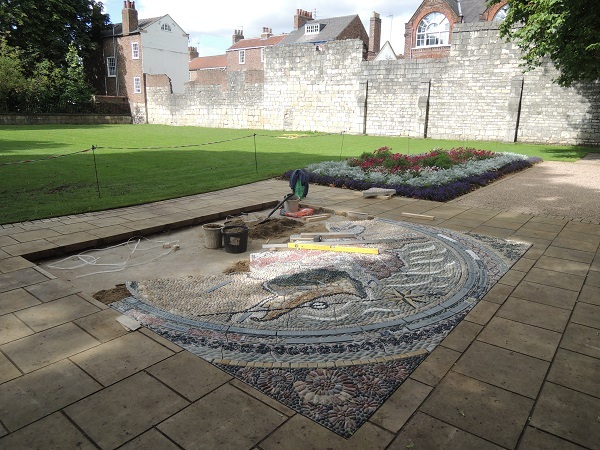 Wander past the historic remains of St Mary’s Abbey, to view the latest addition to York Museum Gardens. This beautiful new artwork – a 4m × 4m walk-on pebble mosaic – depicts the Yorkshire section of William Smith’s famous geological map of 1815. Artist Janette Ireland used many imaginative devices – including fossils, both real and formed from pebbles, discarded stone from the minster and tiny millstones made of millstone grit – to represent the ideas which Smith was demonstrating in his map. The walk-on mosaic map was commissioned jointly by the Yorkshire Philosophical Society and York Museums Trust in 2015. It represents the Yorkshire part of William Smith’s famous map – the subject of Simon Winchester’s best seller The Map That Changed the World. Smith’s map was an incredible achievement. It was the first ever geological map of a whole country, and was surveyed by Smith alone, travelling on foot and horseback. It shows the rock groupings nearest to the surface, and illustrates Smith’s discovery, based on his understanding of the embedded fossils, that rock strata are continuous across hundreds of miles, but generally tilted towards the east. 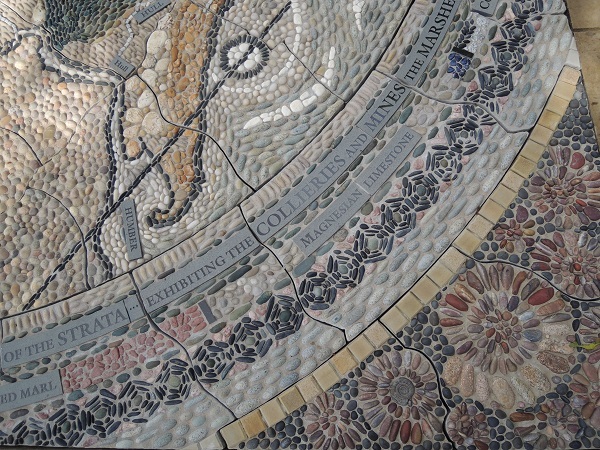 The pebbles in the mosaic reflect the colours Smith used in his map, but genuine Yorkshire rocks are displayed in the flower beds on either side of the mosaic, alongside strips of the pebbles used to represent them. An original copy of this famous map can be seen in the Yorkshire Museum, which also houses one of the best fossil collections in the country. The museum, now run by York Museums Trust, was built in 1830 by the Yorkshire Philosophical Society, who sponsored a course of lectures by Smith, and employed his nephew, John Phillips, as the first Keeper of the Museum. The map is free to visit. Please click here for further information on visiting the Museum Gardens. A leaflet on the mosaic can be obtained from the Yorkshire Museum or the Yorkshire Philosophical Society. You can also download a copy of the leaflet by clicking here. A leaflet suitable for children visiting the mosaic can be downloaded here. For additional information on the rock samples please click here to download the leaflet. Details of and images from the project is available on the Yorkshire Philosophical Society website. Please click here for information on William Smith’s original map at the Yorkshire Museum. 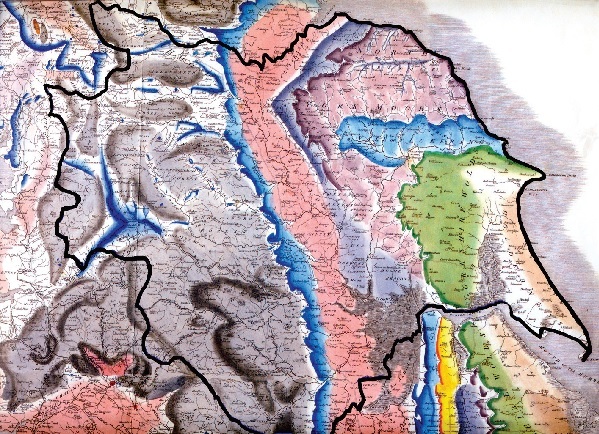 Close up of William Smith's map of 1815. 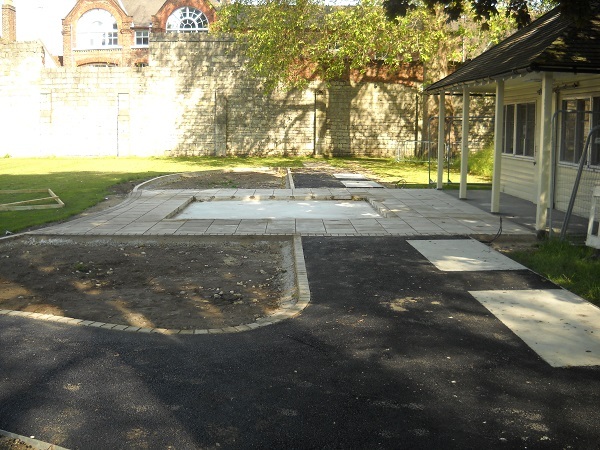 The site being prepared for the new mosaic. Janette Ireland's work is carefully put in place. A close-up of the intricate mosaic map.